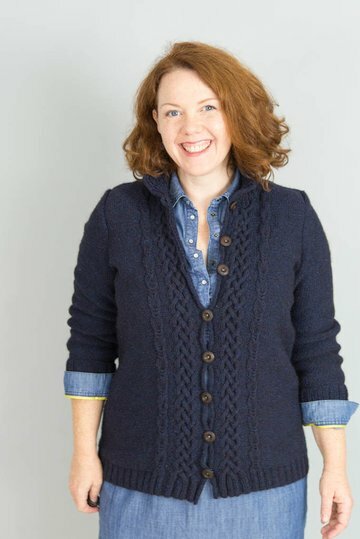 This woodsy, cabled cardigan is a perfect match for a chilly fall hike - or thinking about a chilly fall hike at another time of the year! 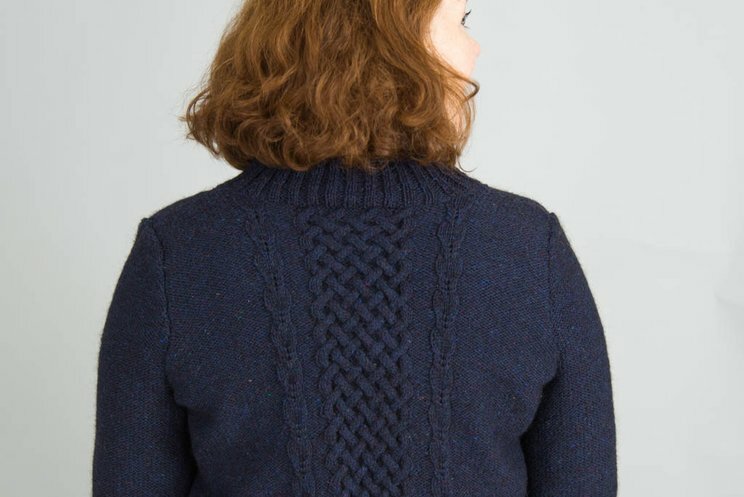 I designed it for my fall 2016 "make wear love" retreat, and features simple-to-knit but intricate-looking basketweave cables on the front and back. 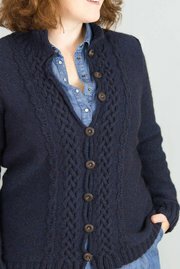 The sleeves, hem, and mock turtleneck are trimmed with a classic 2x2 ribbing, but the cardigan is closed with a tidy i-cord edge. To ensure that the cable panels don't overlap with any shaping, Back Cove is a straight-sided design. Two notes on this design: First, please swatch in Reverse Stockinette stitch. Additional stitches to compensate for cable "suckage" will be added automatically by CustomFit. Second, cabled designs in CustomFit are intermediate - advanced level, for two reasons. First, explicit set-up instructions are given for the cable panels only; you will be responsible for managing any partial repeats of ribbing outside the cable panels. Finally, since the cable panels are fixed in their stitch counts, I strongly suggest using a DK-light worsted weight yarn to ensure a similar sized cable panel to the garment shown. Pictured in straight silhouette. Please see our page on silhouettes for a full explanation of silhouettes in Customfit. I used Green Mountain Spinnery Alpaca Elegance for this sample, in the color "Ceylon". 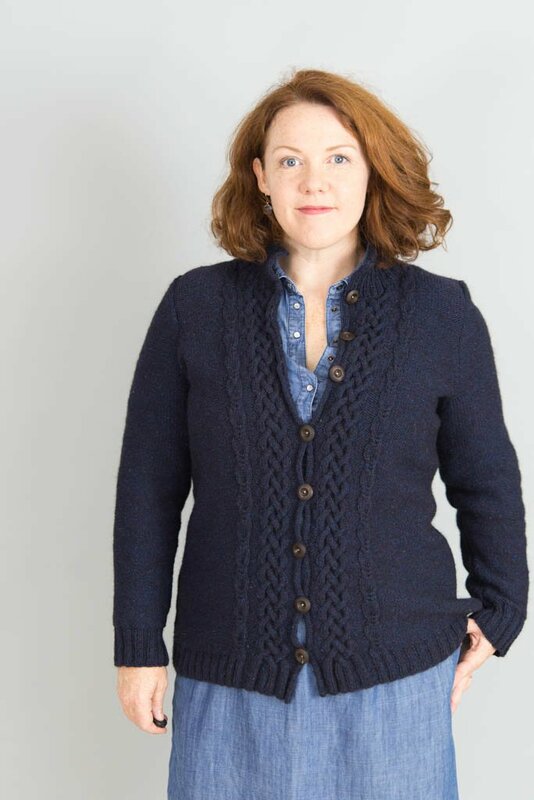 I love Alpaca Elegance - the woolenspun construction of the yarn gives it incredible lightness, the alpaca gives it just a touch of drape, and the tweedy, nubby look of the yarn is a perfect complement to the design. I liked it at a gauge of 22 stitches and 30 rows = 4'' in Stockinette stitch; at that gauge, for a standard size 30 (32, 34, 36, 38, 40, 42, 44, 48, 52, 56, 60)'' sweater you'll need approximately 7 (8, 8, 9, 9, 10, 10, 11, 11, 12, 13, 13) hanks. My sweater, an extra-long 42'' garment, used 10 hanks. If you are substituting yarns, please keep to a roughly DK / light worsted gauge to preserve the scale of the cable. 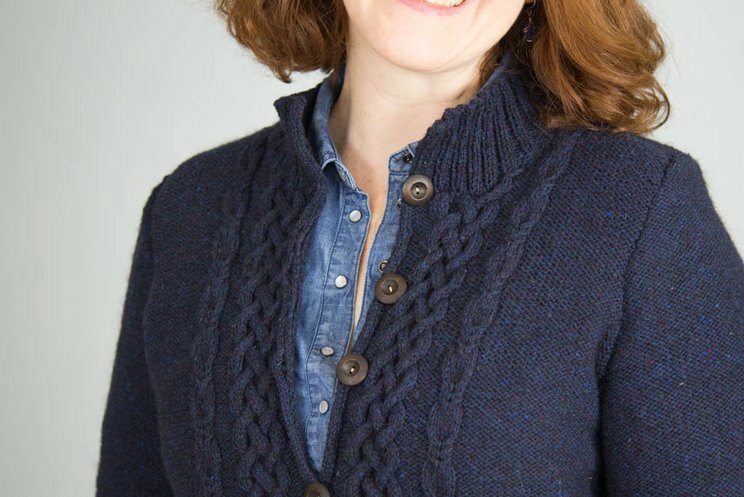 If you must use a different weight yarn, to keep the proportion of the garment, smaller knitters might consider going a touch lighter weight; larger knitters might consider going a touch heavier weight. Silhouettes: Pictured in straight silhouette.